Palestinian prisoners’ heroic hunger strike is continuing as strikers enter their 14th day of the “Battle of the Empty Stomachs,” launched on April 17, Palestinian Prisoners’ Day. Palestinian prisoners are demanding an end to isolation and solitary confinement, administrative detention/imprisonment without charge, and access to family visits, education and media. These prisoners have explicitly called for international solidarity – act now to support their struggle! Send a letter to Israeli authorities demanding full implementation of the prisoners’ demands. Palestinian prisoners Bilal Diab and Thaer Halahleh, administrative detainees now on their 63rd day of hunger strike, face serious and severe health deterioration, while national leader, Popular Front for the Liberation of Palestine General Secretary Ahmad Sa’adat, has been moved to Ramleh prison hospital. Sa’adat had issued an earlier letter speaking of prisoners’ high morale. Palestinian Legislative Council member Jamal al-Natshe is also facing increasingly dangerous health threats. Prisoners have rejected various attempts to divide them or undermine their demands, including a proposed modified isolation, and an attempt to bargain for Sa’adat’s release from isolation in exchange for PFLP prisoners leaving the hunger strike. Nevertheless, repression against prisoners has continued, as numerous prisoners have been moved from prison to prison; prisoners are fined 250-500 New Israeli Shekels daily; and Addameer lawyers are barred from the prisons. Nonetheless, the resistance continues. The prisoners’ Higher Leadership Committee issued a new Statement No. 2, vowing to continue until their demands are met. 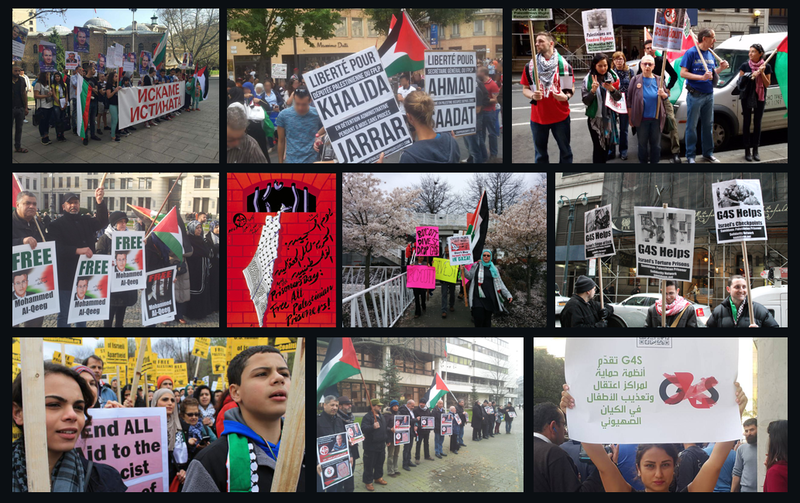 Calls are echoing throughout Palestine and on social media around the world for a general strike May 1, for International Workers’ Day and the prisoners. 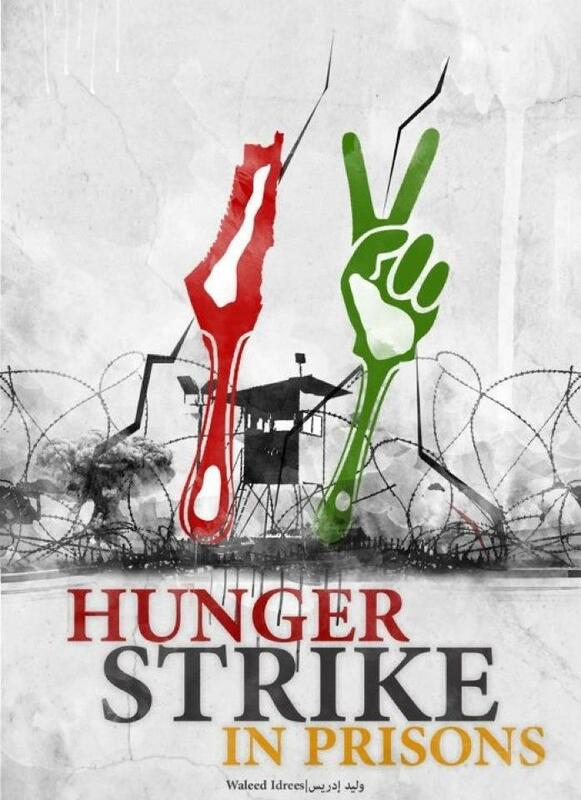 A protest will take place outside Ramleh prison hospital, where hunger strikers are held, on Thursday May 3, while daily pickets will take place in London in solidarity with the prisoners. Successful and growing protests are taking place around the world and throughout Palestine – but more action is urgently needed as the prisoners’ lives, health and bodies are on the line for their rights, dignity, and their cause and people. 1. Sign a letter demanding the Israeli state implement all of the demands of hunger striking Palestinian prisoners. Tell the Israeli Prison Services that the world is watching! Click here to sign. 2. Join a protest or demonstration for Palestinian prisoners. Join in the call for May 1 actions – include prisoners in your May Day activities. Organizing an event, action or forum on Palestinian prisoners on your city or campus? Use this form to contact us and we will post the event widely. If you need suggestions, materials or speakers for your event, please contact us at samidoun@samidoun.ca. 3. Contact your government officials and demand an end to international silence and complicity with the repression of Palestinian political prisoners. In Canada, Call the office of John Baird, Foreign Minister, and demand an end to Canadian support for Israel and justice for Palestinian prisoners, at : 613-990-7720; Email: bairdj@parl.gc.ca. In the US, call the office of Jeffrey Feltman, Assistant Secretary of State for Near East Affairs (1.202.647.7209). Demand that Jeffrey Feltman bring this issue urgently to his counterparts in Israel. 4. Write to the International Committee of the Red Cross and demand they uphold their duties to protect the rights of Palestinian political prisoners. Click here to sign a one-minute letter and make your voice heard! 5. Distribute materials, including factsheets and videos, telling the story of Palestinian prisoners. Click here for videos and here for factsheets.